Todd has done something cool. 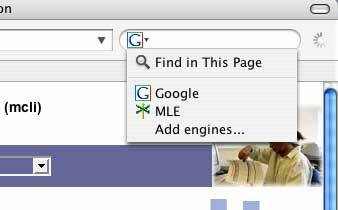 He published a search plugin for Mozilla/Firefox web browsers that provides a direct keyword search into the Maricopa Learning eXchange (MLX). I don’t do a lot of browser hopping beyond testing on the major brands. I’ve taken the cues from the Zeldmans out there to develop and test for on the more compliant web browsers (Safari), then test, hack, and fix for the oddities of Internet Explorer, etc. Netscape 4? Fuggedaboudit. Anyhow I keep a copy of Mozilla or Firefox around since sometimes there are web sites (like a lot of our Maricopa system apps) that are finicky on browsers. The long amble is that I have not spent much time in looking into this search engine add on, but it is pretty slick, and opens the mind to creating more browser tools. goes zing! to the MLX and produces the same results as if you were at our site. It’s pretty cool, though sadly, it helps a pithy minor percent of of web site traffic.